So, I got myself appointed the Florida Writers Foundation Silent Auction Chairperson. The Silent Auction is an annual fundraiser for the FWF (which is the charity arm of the Florida Writers Association), a non profit 501 (c) 3 benefitting literacy. The Silent Auction is held at the annual FWA Conference in Lake Mary, FL (October 22-24, 2010). Because it's pretty close to Christmas, many attendees use the auction for Christmas shopping, so literally any donation is useful. I will take some of the smaller donations to make larger baskets, and some will be used for a raffle. However, I'd love to get a bunch of critiques and other writerly prizes and auction those online a couple of weeks before the conference so everyone can bid! Yay! So how can you help? Spread the word! Send me donations! I plan to choose one critique or prize for the online auction and put it up for raffle. Anyone who spreads the word (blog post, tweet, message board post, etc.) will get a free ticket for that raffle. 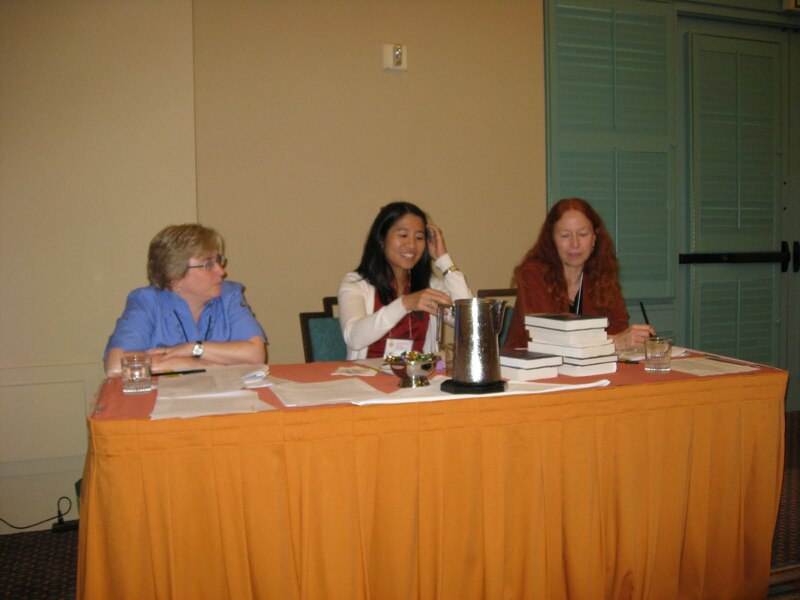 As promised, here are my notes from the Novel Intensive, featuring Kathleen Duey, Alvina Ling from Little, Brown, and Stephanie Owens Lurie from Disney/Hyperion. The first topic the Thrilling Three covered was Character. Alvina Ling – Character is Voice, Beliefs, and Experiences. You need to know these things about your character. Try to get out of your character's way. Get to your art and your craft will take you the rest of the way. There are no rules except you want to write your book in such a way that people can't put it down. Get out of your writing cave and observe children. She recommends mall food courts. You can hear kids talking when they don't think anyone is listening. Character is the spine of everything. Try writing from your secondary characters' POVs to get to know them and their motivation better. Then we had a writing exercise to introduce a character in half a page or less. Both Alvina and Stephanie read examples of strong character introductions aloud. Then some volunteers read their introductions (written on the spot). What I got from this exercise is that a great character is distinct and interesting. The more the reader is pulled into the character's head, the better. Stephanie said she wants to either feel she IS the character or that she COULD BE the character. Tiny details can be more interesting and telling. Spend time on things the reader will not assume. Magic has to be flawed in and of itself. There has to be a kryptonite (Superman wouldn't have been interesting if he could conquer everything). Stephanie Lurie – Avoid vampires or werewolves. Right now, apocalyptic/dystopian is hot. Next is angels (mostly fallen). She sees a lot of girls who died and are coming back. Alvina Ling – Would love a sci fi (more space opera than dystopian). Regarding Plot – Kathleen Duey – There is no magic formula (or if it exists, you don't want it). The Thrilling Three also read first pages and queries. Kathleen Duey – In queries and synopses, try not to name anyone but the MC because you'll be compelled to describe them. Do that with two or three side characters, and you've added an unnecessary paragraph. She recommended leaving other names off completely at first (use BFF or the like), and then add names if they are necessary. She also said in a synopsis, to tell both plot and emotional arcs. Alvina Ling and Stephanie Lurie said that in a query, social networking is of interest (blog, twitter, etc), but conference attendance not necessary. They like "Readers of _____ will enjoy my book." But make sure the titles are current, in the same genre, and not blockbusters. Alvina said she's looking for something familiar but fresh. Stephanie said if you can give her the one-sentence pitch, the query summary (like jacket copy), and a great synopsis, she'll love it. She needs all three to acquire your book. As a final note, Kathleen said that it's the subtle things that make a book believable or not. So there are my notes from Friday. I hope you find some of that helpful. Tell me in the comments what your favorite nugget is! See you on Friday with my notes from the Picture Book Track and my critiques! SCBWI FL Mid-Year Workshop Part 1 + GIVEAWAY! This conference was AMAZING. Words cannot express how amazing, but I shall humbly try. My conference experience started with picking up Kathleen Duey from the airport (I KNOW, right?). I have said before that she is the single most inspiring person I have ever met, and she is even more so now. She is so genuinely nice, helpful, and just fun to be around. You can tell she's really listening to you when you talk to her, and that she truly cares about everyone. I brought the fabulous Jackie Dolamore with me to pick Kathleen up, since they had wanted to get together while she was in town. At the hotel, we joined the other speakers and volunteers for dinner, where I got to sit next to the lovely Terri Farley, whose book I am giving away shortly. She is really a wonderful person. Very sweet and fun to talk to. The next day was the unbelievably awesome Novel Intensive. Here are the awesome books you can win! 1. You must comment here to be entered in the drawing (1 entry). 2. Old followers (following before June 6) get two additional entries. 3. New followers get one additional entry. 4. Tweeting/facebooking/blogging this giveaway earns you 2 additional entries for each instance (please include link in your comment, and if tweeting, use @lchardesty). 6. You will get one additional entry each for commenting on Wednesday and Friday's posts. 6. Include your email in your comment. 7. Please add up your entries in your comment. 8. Giveaway ends at midnight EST on Friday, June 11, and winners will be posted by Monday, June 14. Ready, set, go! And thanks for reading. It really means a lot. While perusing my blogroll, I came across an absolute GEM from the amazing Carrie Harris, and I just HAD to share. This is so hilarious, I have no words. I give you the Sleep Talkin' Man. (Sorry, embedding is disabled). You should follow Carrie if you aren't already. She comes up with genius like this all the time. (For further info on awesome people you should follow, see my fun interview with Heather Kelly). Finally, I'm going to another conference! Squee! The SCBWI FL Summer Workshop is June 4-5. I'm soooooo excited. I'm going to the Novel intensive with Kathleen Duey (the genius) and Alvina Ling (HELLLOOOOOO), and the Picture Book track with Tammi Sauer and Dan Santat (no, I'm not kidding). Can you feel the awesome? Oh, yeah. This time, I'm going to let you vote! So. Look at the line up here and tell me in the comments which author and book you'd like to see me giveaway. I will pick the top two. (I know I gave away three last time, but summer is coming and three of my four jobs stop over the summer). ETA: I'm entering Maggie's contest for Linger stuff. If you haven't seen the new trailer for Linger, you must watch it now. It is AMAZING. She also did four making-of posts on her blog. Super cool! Hooray! I've been interviewed by the super awesome Heather Kelly! I went to a movie recently and was excited to see a semi-preview for Avatar: The Last Airbender, the movie. If you aren't familiar with it, go here. My son started watching this show, and I found myself getting caught up in it. Great graphics, great story. I thought, Oooh, this oughta be great as a movie! The trailer was pretty generic, showing more effects and cinematic views than characters, so I didn't realize it had been whitewashed until today. I came across Moonrat's post titled whitewashing The Last Airbender, which pointed me to Ellen Oh's blog post Whitewashing is Racist. After which, in tears, I followed links to sign a petition boycotting the movie. Please, go read Ellen's post. And pass it on. Keeping in mind that I am not a professional reviewer, here we go. This post will contain spoilers for the first book, The Farwalker's Quest. If you want to read that first, go do so. You can always come back! ;) Plus, the paperback just came out! Lucky you! The Timekeeper's Moon is the sequel to Joni Sensel's The Farwalker's Quest. In it, Ariel Farwalker hears the call of the moon and sets out on a journey. She and her guardian, Scarl, must follow a mysterious map found at the Tree-Singer's Abbey. I really enjoyed this book. A lot. Beyond the fantastic description and amazing characters, these two books are a must-read for anyone writing a series. The first book can stand alone. There are no cliffhangers, there is no question it is a complete story in and of itself. It's awesome. Finding out The Timekeeper's Moon is the second book is like finding out you have a whole 'nother pack of cookies after you thought you ate the last one. You mean there's more?!? SWEET! But better. Then, Joni does flawlessly what many others fail at, which is giving the reminders/backstory of the first book, so that readers who read The Farwalker's Quest a year ago will remember what happened. There was no info dump. There was no yeah, yeah, read this before, I remember, let's move on skipping ahead (which I do a lot, because I read A LOT of series, and I get sick of it). Seriously, Joni - standing ovation on that. So, besides the sheer awesomeness of the story, the beautiful descriptions, and the fun little tidbits from our world (the books are set in the far, far future), my favorite part of this book was the relationship between Ariel and Scarl. What a beautiful, complex relationship! If you are interested in reading this ARC, go here and enter to get a chance! Hurry! Otherwise, buy it when it releases in March! SCBWI FL Conference Wrap Up! Before I start, if you haven't attended a writing conference, find a way to do it. It is such an amazing experience, and you learn so much. It's worth the registration fee just to be around other serious writers and to be able to talk about writing with people who get it. If you're in FL or would like to come here :) the summer workshop is scheduled for June 4 & 5 at Disney. Thursday night, there was a pre-conference book signing, which was when I got the books for my giveaway signed. If you haven't entered, GO ENTER! I was going to go through day by day, but I think that will take too long. LOL. I'm just going to list the takeaway quotes (paraphrased) that stuck with me enough that I wrote them down. There is just no way to capture the spirit of a writing conference in words (haha). It's like inspiration and encouragement float in the air, and you breathe them in every moment. Anyway, here are the important notes I wrote down. Richard Peck: I never wrote a word of fiction before I was 37 years old. Kathleen Duey: Those amazing debut books (S. Meyer, J.K. Rowling) are a fluke. Deciding to do that is like deciding to be struck by lightning and working toward that. Kathleen Duey: Don't ask what should happen next in your story. Ask yourself what your protagonist would do next. Richard Peck (via Kathleen Duey): Take yourself out of your manuscript. Kathleen Duey: Raise the climax by making more subtle what precedes it. Kathleen Duey: Give yourself cues for your work: workspace, music, food/drink, smells, and change them if you are working on two projects to help move between projects. Kathleen Duey: Anyone can be a great critiquer if you have them use the BCD method - mark in the ms where they are Bored, Confused, or Don't believe it. Kathleen Duey: The only rule is there are no rules. Kathleen Duey: You don't have to start with a bang. You have to start with a reason to turn the page. Kathleen Duey: When you're having trouble with your character, sit down and type an interview. Not a set of questions, but a conversation, like you're talking to a child (your mc) you haven't met. Kathleen Duey: When you have a great writing day, figure out why and do that again. Kathleen Duey: Gag your inner parent. Kathleen Duey: Don't let your characters choose between something easy and something hard (that's boring - give them a difficult choice). Richard Peck: Humor is anger that went to finishing school. Richard Peck: There never was a writer who was not a reader. Jill Santapolo: Inject emotion organically with: actions, word choice and syntax, objective correlative (put emotion to an object - winter tree looks dead to someone facing hardship, etc. [explanation and example are mine]), and dialogue. Alexandra Flinn: Write what you're on fire about. Kathleen Duey: To write a good synopsis, don't name anyone but the MC. It's too easy to go on a tangent if you focus on anyone else. Kathleen Duey: On where to start your story: It's like picking up a puppy. In front of the middle, but not too far. Kathleen Duey: On revision: Before revising, sit down and recall your reason for writing the story - the spark. Write it down and post it somewhere. Revise to enhance that. You may notice that most of those are from Kathleen Duey. Yes. She is absolutely amazing. I have never been more inspired by a person in my life. If you ever have a chance to hear her speak, DO IT. (Oh, and she's coming back to FL in June...just sayin'). So, those are the takeaways I wrote down. If I can figure out a way to coherently write down more of the experience, I will. I will also point you to some other blogs with wrap-ups, since different people may have honed in on different points. Here's one: mindyalyse . I will try to post pictures this weekend, and I am expecting my turn with the ARC of Timekeeper's Moon by Joni Sensel, so look for my review of that.